It would have been an easy decision to cancel our plans. Record-breaking cold was expected throughout Southern Ontario … but we packed up our warmest clothes and went anyway. Our destination was Niagara Falls. Although Gilles and I had both been to the Falls numerous times, we hadn’t been there together in over 20 years and I had an agenda. 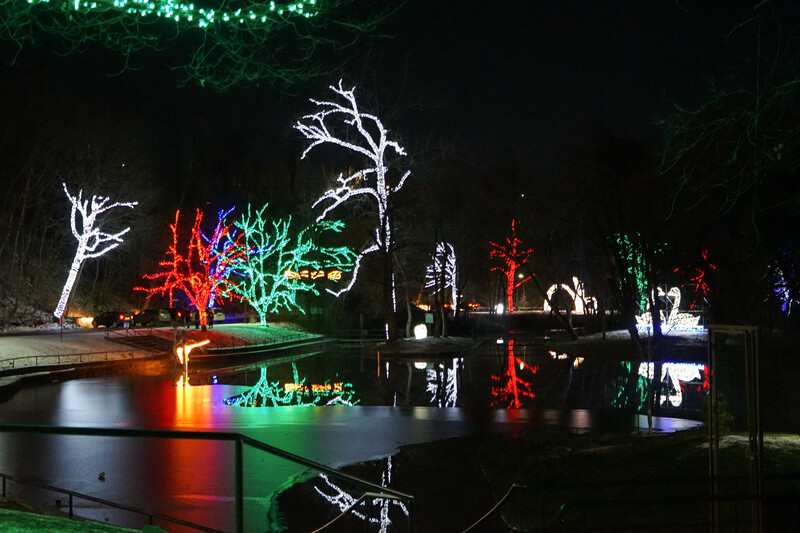 Like many Canadian communities, Niagara Falls has a Winter Festival of Lights which coincides with the holiday season. 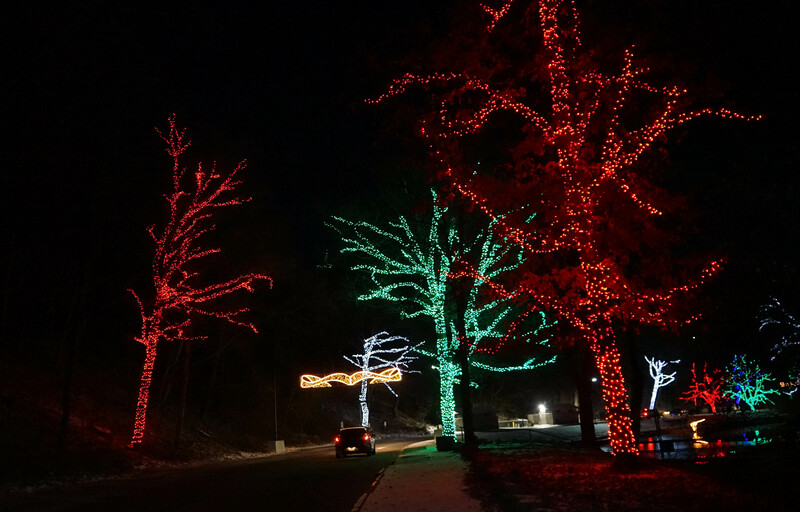 There are light displays along a 2 kilometre stretch starting at the Falls …. and I wanted to finally practice my non-existent night photography skills. Oh yes, it was cold. It was -13C (8F) cold … without the windchill. I had planned on walking the 4 km route (out and back) but quickly changed my mind. Instead we drove the route back and forth several times, parking occasionally on the side of the road to zip out for photos. After a while, Gilles simply admired the lights from inside the car while I fumbled in the cold with my tripod. While I ooo’d and ahhh’d over the colours and reflections, Gilles (aka Mr Science) pondered penetrating questions like ‘how long would it take to set up all these lights?’ and ‘how many thousands of lights did they need?’ and ‘where are all these lights plugged into, anyway?’. In the end, we were both in awe of the experience. I’m quite happy with my first endeavours with night photography, in spite of taking multiple ‘shortcuts’ to minimize my time in the cold. In hindsight, I probably should have started practicing in the warm weather … but where would the challenge have been in that? Now I’m curious too. Where ARE the lights plugged into?? Great post! Heheh, I can so well imagine your husband and his musings, and you going about your photos, familiar scene 😉 Beautiful lights! Truly enchanting post, Joanne. I loved these colorful photos that you did so well in the dark and freezing cold. Admired the challenge you both met with the freezing temperatures. And I love the light show, such creativity and brilliant engineering too. Enjoyed your words, offering the full experience. Great post. Thanks Jet. I was rather proud of this attempt at winter photos. The cold definitely makes it a challenge! What a beautiful light display! It makes our efforts to decorate our house look rather puny. Any amount of light at this time of year is appreciated to chase the darkness away … but these big displays are certainly eye-popping. Thanks for the lovely photos, for braving the cold for us! I would love to visit Niagara Falls again! My fascination with the Falls didn’t start until after I retired. Now I can’t seem to get enough of this interesting area! I just love being by water, ocean, falls or lake. It’s just so peaceful and mesmerizing to watch and listen to. It is my Happy place! Oh yes, absolutely stunning. You can strike out that “non-existent” part. I have never even seen a tripod from close up. Hi Joanne. What a lovely festival. You did fabulous work! I love all the colors. LOL, it’s too bad you couldn’t find where they were plugged in… you could have brought a space heater and a long extension cord. Of course somebody would have gotten upset at whichever figure you had to unplug, but horsefeathers — that’s just too cold. Hugs! Thank you for braving the cold (your fingers must have been numb!) to bring us these gorgeous photos. I would say your night photography skills are top notch! Thanks – I consider it beginner’s luck 🙂 … and yes, my hands were freezing, even with mitts. Wonderful pictures. Winter brings great opportunities to photograph amazing lighting in our neighborhoods or spectacular light feastivals! We are New Englanders in Florida for the winter for our first season…but we’ve been keeping in touch with folks and the weather up north and heard about your cold spell. You did well to change your plan and drive the route! Been reading your blog for a while but finally subscribed…don’t know what took me so long! Lol! Anyway, reading established blogs like yours gives me inspiration for my own! Thanks! Good luck with your first season in Florida. I imagine the months ahead will be full of firsts. Have you moved to Florida permanently, or just in a winter residence? You’ve wowed me with your ‘non-existent’ (#not) night photography skills! Perhaps it is that you such a wonderful muse. 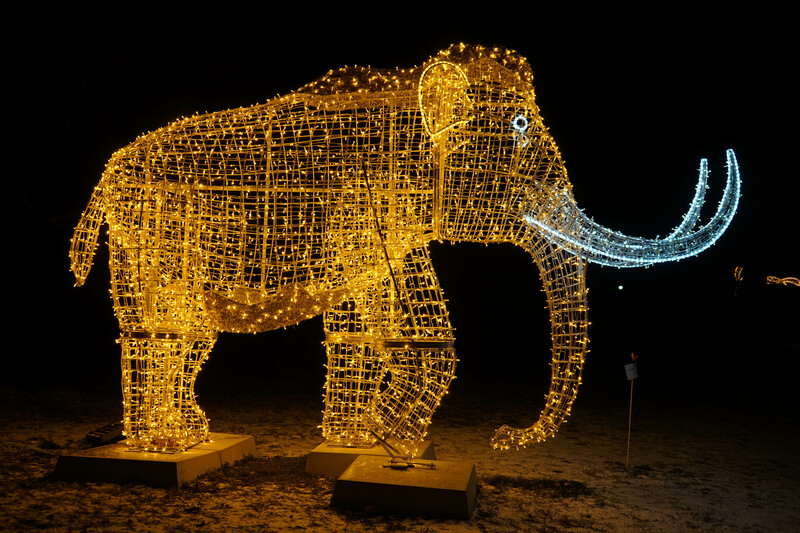 The ‘Winter Festival of Lights’ are like a wonderful safari excursion! Like you, I ‘oohed’ and ‘ahhed’ at every one here .. but lucky for me I did so in the warm springtime temps of Durban …oh wait, the winds just kicked up, time to head back indoors! Where would the challenge be indeed! I can’t even begin to imagine what – 13 feels like!? Thank you for braving the elements to share this beautiful experience – incredible! A reprieve – hope you are enjoying the changes as they come around! Beautiful photos Joanne! Did you use specific settings as they all turned out great? Niagara is such a great area to explore. Have been many times in spring, summer & fall but I yet to visit in the winter. What a lovely thing to have. Your photos were great. I’ve been to the Niagara display once before and really enjoyed it – but you were brave to get out of the car! 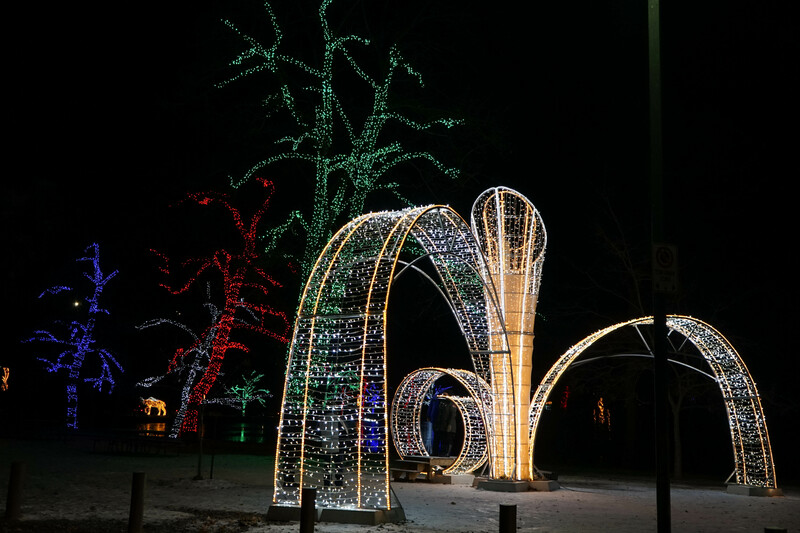 I’m planning on going to see the display at Ontario Place one night – that could be another cold weather photography challenge for you! Come to think of it, we did notice many Italian restaurants as we were trawling Main Street looking for a place to have dinner. We ended up at one place that (mid-week and off-season) was quiet and the food was great. I admit that the lights helped nudge my grumpy Scrooge soul into more of a Christmas spirit – as well as my Husband who promptly pulled out our Christmas lights and put them up outside in the freezing rain. Gorgeous lights, Joanne! And you did exceptionally well with your night photography. It would have been a bit too cold for me to set up a tripod and take a photo, so I applaud your efforts. I would have been in the car with Gilles. Brrrr!! I bet, though, you had something hot to drink afterward. Maybe a couple of hot adult drinks, huh? I was at Niagara Falls (on the Canadian side) a number of years ago, but didn’t go on the boat ride. I would do that if/when I get back there again. I was amazed to see that the boat was still operating from the American side. That would have been one very chilly ride!! I took my cousin from the Netherlands on the boat a couple of years ago and we got thoroughly wet! Maybe they don’t go as close to the Falls in the winter. I was sure the captain of our boat intended to sail right through the deluge. I admit it actually scared me. Your photos are stunning! I am very humbled that you went out into such frigid temperatures for the sake of ‘art’ and very grateful that Gilles was there to ‘assist’. My daughter bought me some fingerless gloves so I can take photos in the colder weather. They have a little cap which folds over like a mitten. I notice you stayed over even though close to home. I think close to home holidays are perfect. Not too far to drive to and yet a different area to explore. Your use of a tripod makes me think I need to experiment using one. Thanks Jo!! Fingerless gloves wouldn’t have helped in these conditions. I had fully lined mitts on and my hands were freezing. I think it was from handling the metal tripod. The cold just seeped through my mitts. I didn’t even consider using the timer to avoid camera shake from the shutter but in spite of it, I’m quite happy with these first results! This is the first time Gilles and I have taken an overnight mini-vacation close to home and we both agreed that it’s something we should do more often. As my youngest son once wisely said, we chase the ‘big bangs’ in life but it’s the ‘small moments’ that have the most meaning. On ‘big holidays’ we are always rushing about trying to squeeze in as much as we can, but on this mini-vacation we were really laid-back. As you said – it was perfect! You shine in your first foray into night photography! Its hard to believe it got so cold in Niagara Falls. AKA the tropics of Canada. The cold this November has certainly been an unwelcome surprise. Gray skies I expect this time of year, but the frigid temperatures are something else … and with the spray coming off the Falls, yikes! I hadn’t thought about the added challenge of dealing with spray. Your photos are so perfectly clear. Bravo to your photograkills Joanne. I find the cold weather very challenging for taking photos. I chuckled at the questions science minded Gilles was asking. I have a very like minded partner! omg – it’s too funny that you mentioned “sacrificing for your art”. Earlier this fall we had attended a play where this was one of the running jokes throughout the story line. And I bet you were! Those are really good photos, especially as a first time night shooter, and especially considering the cold. I think I’d have stayed home with hot chocolate. I’ll admit that it was pretty tempting to simply stay indoors – especially since we had a nice bottle of wine and a little fireplace back at our B&B. Thank you for your kind words about my photos. Coming from you, I consider that a major compliment!! Great photos. Sydney has a winter light festival called Vivid, but it’s not nearly as cold as this one! Me too! Light displays make me a little giddy 😍 … I’m ooo’ing and ahhh’ing all over the place. NEVER gets tired! We had a great room for a great price in a lovely B&B about a mile down the road from the Falls. We’ve never done anything like this before – booking an overnight stay within a 2-hour drive of home, but It was the perfect mini-holiday. I’ve been to Niagara falls twice, but once as an adult. It was the fall of 2001, and Rob and I had gotten married the July prior. It was our first trip after 9/11 and a very welcome refuge. We got an awesome deal through AAA, in a hot tub room, and the fall colors were absolutely gorgeous. I fell in love with the place! I am jealous of you for getting to go there at all, and this time of year it would be breathtaking! There is the common expression to describe the Falls – “the power and majesty” – that pretty well sums up their allure. I never seem to grow tired of seeing them ‘one more time’, although I would give winter a bit of preference. True, it’s off-season and a lot less crowded (not to mention that a lot of things are closed), but the frosting of the surrounding trees caused by the mist is spectacular! Well, I’m in awe. I hope this cold snap is a quick snap for you guys up there in Ontario. Thanks Erica – the reflections were my favourite too. The water was so amazingly still. I think the tripod made a huge difference to keeping the camera still. Admittedly, because of the cold, I was using it more as a monopod so I could take quick shots. As a result, I was getting some blur from camera shake. Had it been milder, I would have taken more time. 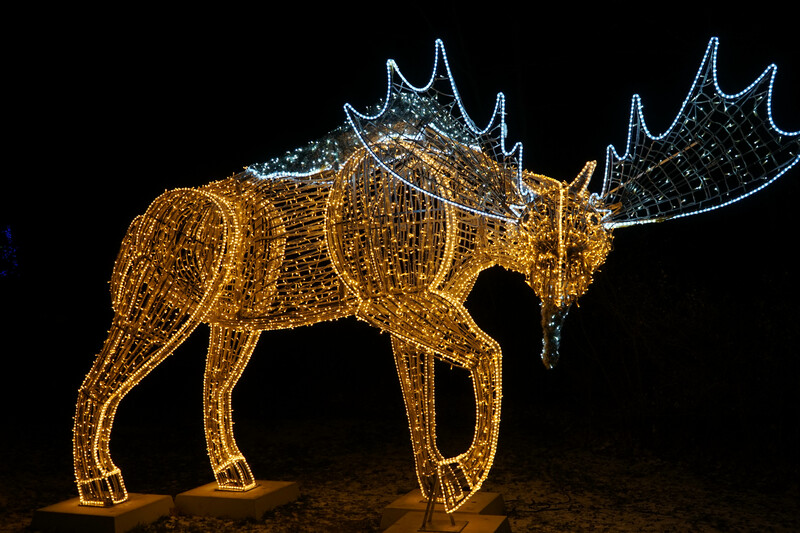 We did manage to find the power outlet for one of the displays (the moose). It appears that there are outlets all over this park area – maybe a foot off the ground. The cost and effort to put in all those outlets would have been significant!! Great night shots Joanne. Sounds like you guys had fun. I’ve never been to Niagara Falls. Obviously if I ever go, I’ll have to go twice – once in the summer, and once in the winter! So, what was your technique for the photos? I chuckled at you comment about -13C. You are so right – sometime this winter, it will seem like a wonderful mild temperature! I shoveled the white stuff today, again, in -4C, took photos of the new snow, and thought it was positively grand! The Falls really is something that should be experienced In both seasons. The spray from the Falls frosts everything around it which is magical. Your photos are great. Thanks for braving the cold and taking them. I didn’t know about Niagara Falls Festival of Lights, but it looks spectacular. You’re warmer now? I’m really happy with most of the photos I took. I can imagine how disappointed I’d be if they all turned out a blurry mess. I didn’t know about all the Festival of Lights either. I love all the light displays at this time of year – makes me feel like a kid. We had the opportunity to go to Niagara in January of 1978. We were staying with an aunt in Michigan and wimped out. We were so cold the minute we stepped outside. We only had lightweight (Australian) winter clothes. Anyway two years ago we finally made it to Niagara Falls ( in early Summer). You are very brave but at least you were dressed for the weather. Great photos! I can imagine how brutally cold it must have felt for you – going from your hot summer temperatures to our January deep freeze!! Even for us, it was very tempting to wimp out!! I hope you enjoyed your visit to the Falls. The city is a bit of a tourist trap but I love the Falls and rejoice every time I see them … although on this trip ‘seeing’ the Falls was actually a challenge with all the low hanging mist. These I ages are gorgeous Joanne, I think you did great 😀 My big question comment would have been – I hope they’re not all plugged into the same receptacle. We did manage to find one power source to satisfy Gilles’ curiosity but after that I was happy to simply enjoy the magic. Mr. Science would have wonder how long would it take you to freeze taking night photography? And you have proven him wrong that you did not and able to take all these gorgeous lights! My niece lives at Niagara Falls. I wonder how she is faring. hehehehe! He didn’t have to wonder if I was freezing – I was quite vocal about it, especially the one time I jumped out of the car without my hat and mitts. I thought I’d only be ‘a minute’. It wasn’t. By the time I got back into the car, I was a popsicle. Beautiful shots, in my view. I hate tripods, but it’s hard to do night photography without them. I can imagine just how hard that must have been to mount the camera and adjust the tripod with frozen fingers. I’ve always avoided night photography because of the whole tripod thing. In my opinion, all that fussing with equipment loses the spontaneity of a photo. I guess that’s the thing with night photography – there is no spontaneity! Because of the cold, I ended up mounting the camera only once – in the car – and used the tripod like a monopod outside. If it had been milder, I would have taken much more time and effort, so overall, I’m pretty happy with the results! I don’t know how Image Stabilization works in camera lenses, but I’m very impressed with this magic, and thankful it was invented. It often makes tripods unnecessary. Glad you didn’t get frostbite!!! You did a good job catching/capturing the light display. It would have been easy to wimp out on this excursion but I’m glad we braved it. We actually had a lot of fun. We agreed that we need to get away together on these small adventures more often. Oh, that sounds so cold, Joanne, but what fun and how beautiful to see all those lights brightening the darkness. I would have stayed in the car too, but you did it and got some great shots. We were so cold … but honestly, it was a lot of fun. We both enjoyed this little getaway so much. To the head of the class for nighttime photography. Great shots. 🙂 I’m a fan of white lights so I really liked that shot. Your photos are fabulous Joanne. And full marks for getting out of the car in those weather conditions. Thanks Su. I’m really quite thrilled with the results. I was just too cold to set up the tripod properly and use the timer to take the shots – so I used it like a monopod. Some of the photos were quite blurry but overall I consider this to be a success! Definitely a success. Come summer you can do some long exposure stuff in your twilight. That would be awesome too. In the summer I played a little with slow shutter speeds with water fountains and was quite excited by some of the results. It’s true that the more you learn, the more you realize there is to learn!! Hats off to you (or maybe keep the hat on)! We have a similar but simpler set up locally and I never get out of the car. Whatever day we pick is the coldest of the year. It looks beautiful and your pictures are perfect! So worth it!